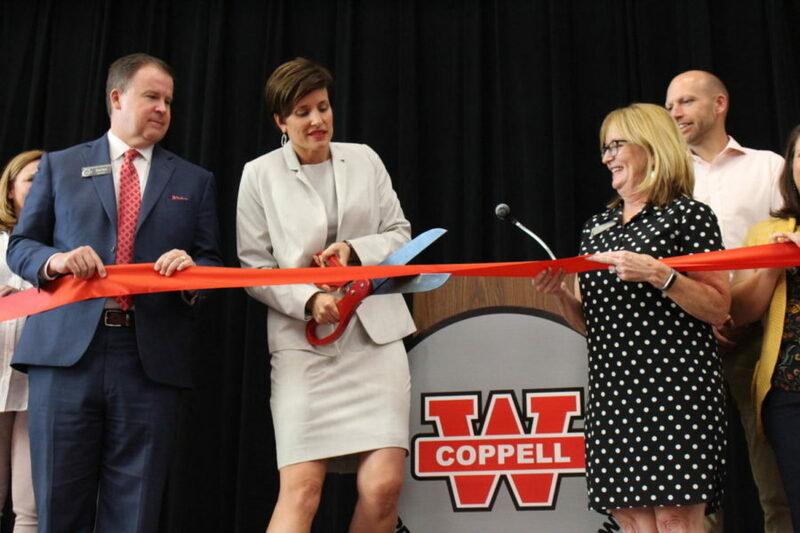 On Wednesday, Coppell Middle School West Principal Emily Froese cuts the red ribbon with Coppell ISD Superintendent Brad Hunt and CISD Board of Trustees President Tracy Fisher to celebrate the grand opening of the new middle school. CMSW hosted its grand opening yesterday to showcase the new type of transparent and collaborative learning that would occur for generations to come. DALLAS – Excitement and delight ran through the air as the Coppell community gathered around the newly built Coppell Middle School West for its grand opening. On Wednesday, CMSW hosted its grand opening to showcase the newly constructed campus and the different type of teaching that would occur for generations to come. Around 300 attended the opening including CMSW students, parents, staff members, former students and even retired CISD teachers. To start the opening, speeches were given by Coppell ISD Superintendent Brad Hunt, CISD School Board of Trustees President Tracy Fisher and CMSW Principal Emily Froese. Followed by a performance from the CMSW choir group, the ribbon was cut by Froese with the community cheering on a future of collaborative and unique learning. Many students who attended the former CMSW were filled with joy to be learning in a different environment, including seventh grader Hannah Tbaba. Not only were the students eager to settle in, many teachers also loved the layout of the new CMSW including dyslexia therapist Pam Yazbeck. But the main reason for the design of the new CMSW is to foster collaboration and communication that will attribute to a better learning environment. 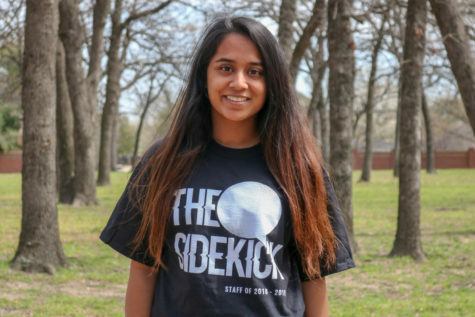 But the concept of adding a new middle school started when secondary growth began to hit south Coppell. To solve this growing issue, a group of community leaders met with the school district leaders to see what could be done. Therefore, it was decided that the former West would be good for the ninth grade center, and CISD decided to build a new middle school in Cypress Waters, where there was much land to accommodate for the growing population. Amid the strenuous two and a half years of planning, Froese is happy the students can learn and maximize their capabilities in a transparent and open environment. “I am just really excited to see the students and teachers coming into the new school to experience the new technology, the little spaces, the big spaces, the gym and the cafeteria. It is just really nice to that we are making this place our own,” Froese said. From transparent windows to flexible furniture, CMSW hopes to be the epitome of unique and collaborative learning, for generations to come.